Nusrat Fateh Ali Khan (Urdu; Punjabi: نصرت فتح علی خان‎; 13 October 1948 – 16 August 1997) was a Pakistani musician, primarily a singer of Qawwali, the devotional music of the Sufis. Considered one of the greatest voices ever recorded, he possessed an extraordinary range of vocal abilities and could perform at a high level of intensity for several hours. Extending the 600-year old Qawwali tradition of his family, Khan is widely credited with introducing Qawwali music to international audiences. He is popularly known as "Shahenshah-e-Qawwali", meaning "The King of Kings of Qawwali". Born in Faisalabad, Khan had his first public performance at the age of 16, at his father's chelum. He became the head of the family qawwali party in 1971. He was signed by Oriental Star Agencies, Birmingham, England, in the early 1980s. Khan went on to release movie scores and albums in Europe, India, Japan, Pakistan, and the US. He engaged in collaborations and experiments with Western artists, becoming a well-known world music artist. He toured extensively, performing in over 40 countries. Khan was born in a Punjabi Muslim family in Faisalabad in 1948, shortly after the partition of India in 1947 during which his family had migrated to Pakistan from their native city of Jalandhar in East Punjab, British India (now in Punjab, India). He was the fifth child and first son of Fateh Ali Khan, a musicologist, vocalist, instrumentalist, and qawwal. Khan's family, which included four older sisters and a younger brother, Farrukh Fateh Ali Khan, grew up in central Faisalabad. The tradition of qawwali in the family had passed down through successive generations for almost 600 years. Initially, his father did not want Khan to follow the family's vocation. He had his heart set on Nusrat choosing a much more respectable career path and becoming a doctor or engineer, because he felt Qawwali artists had low social status. However, Khan showed such an aptitude for and interest in Qawwali, that his father finally relented. He began by learning the tabla before moving on to vocals. In 1964, Khan's father died, leaving his musical education under the supervision of his paternal uncles, Mubarak Ali Khan and Salamat Ali Khan. 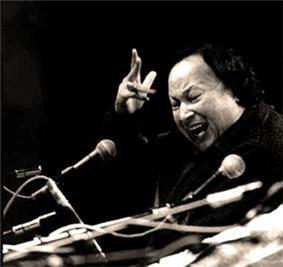 In 1971, after the death of his uncle Mubarak Ali Khan, Khan became the official leader of the family Qawwali party and the party became known as Nusrat Fateh Ali Khan, Mujahid Mubarak Ali Khan & Party. Khan's first public performance as the leader of the Qawwali party was at a studio recording broadcast as part of an annual music festival organised by Radio Pakistan, known as Jashn-e-Baharan. Khan sang mainly in Urdu and Punjabi and occasionally in Persian, Braj Bhasha and Hindi. His first major hit in Pakistan was the song Haq Ali Ali, which was performed in a traditional style and with traditional instrumentation. The song featured restrained use of Khan's sargam improvisations. In 1979, Khan married his first cousin, Naheed (the daughter of Fateh Ali Khan's brother, Salamat Ali Khan); they had one daughter, Nida. Khan teamed with Peter Gabriel on the soundtrack to The Last Temptation of Christ in 1988, with Canadian musician Michael Brook on the albums Mustt Mustt (1990) and Night Song (1996). The team up with Peter Gabriel gave Khan the opportunity to stylize his songs by blending his qawwalis with the Western music. Khan also grouped with Pearl Jam's lead singer Eddie Vedder in 1995 on two songs for the soundtrack to Dead Man Walking. Peter Gabriel's Real World label later released five albums of Khan's traditional Qawwali, together with some of his experimental work which included the albums Mustt Mustt and Star Rise. Khan provided vocals for The Prayer Cycle, which was put together by Jonathan Elias, but died before the vocals could be completed. Alanis Morissette was brought in to sing with his unfinished vocals. His album Intoxicated Spirit was nominated for a Grammy award in 1997 for best traditional folk album. Same year his album Night Song was also nominated for a Grammy Award for Best World Music Album, but lost out to The Chieftains' album Santiago. Khan contributed songs to, and performed in, several Pakistani films. Shortly before his death, he recorded a song each for two Hindi films, Aur Pyaar Ho Gaya work with singer Udit Narayan (in which he also sang 'Koi Jane Koi Na Jane' onscreen) and Kachche Dhaage. He sang "Saya Bhi Saath Jab Chhod Jaye" for Sunny Deol's movie Dillagi. The song was released in 1999, two years after Khan's death. He also sang "Dulhe Ka Sehra" from the Bollywood movie Dhadkan which was released in 2000. Khan contributed the song "Gurus of Peace" to the album Vande Mataram, composed by A. R. Rahman, and released to celebrate the 50th anniversary of India's independence. Rahman, who was a big fan of Khan could not compose further songs with him. As a tribute, Rahman later released an album titled Gurus of Peace, which featured "Allah Hoo" by Khan. Rahman's 2007 song "Tere Bina" was also composed as a tribute to Khan. Ustad Nusrat Fateh Ali Khan was taken ill with kidney and liver failure on 11 August 1997 in London, while on the way to Los Angeles in order to receive a kidney transplant. He died of a sudden cardiac arrest at Cromwell Hospital, London on 16 August 1997, aged 48. His body was repatriated to Faisalabad, and his funeral was a public affair. His wife, Naheed Nusrat, died on 13 September 2013 in Credit Valley Hospital in Mississauga, Ontario, Canada. Naheed had moved to Canada after the death of her husband. She is survived by their daughter. Khan's musical legacy is now carried forward by his nephew, Rahat Fateh Ali Khan. Khan is widely considered to be the most important qawwal in history. In 1987, he received the President of Pakistan’s Award for Pride of Performance for his contribution to Pakistani music. In 1995, he received the UNESCO Music Prize. In 1996 he was awarded Grand Prix des Amériques at Montreal World Film Festival for exceptional contribution to the art of cinema. In the same year, Khan received the Arts and Culture Prize of the Fukuoka Asian Culture Prizes. In 2005, Khan received the "Legends" award at the UK Asian Music Awards. Time magazine's issue of 6 November 2006, "60 Years of Asian Heroes", lists him as one of the top 12 artists and thinkers in the last 60 years. He also appeared on NPR's 50 Great Voices list in 2010. In August 2010 he was included in CNN's list of the twenty most iconic musicians from the past fifty years. In 2008, Khan was listed in 14th position in UGO's list of the best singers of all time. Many honorary titles were bestowed upon Khan during his 25-year music career. He was given the title of Ustad after performing classical music at a function in Lahore on his father's death anniversary. Jeff Buckley cited Khan as a major influence, saying of him "He's my Elvis", and performing the first few minutes of Khan's hit "Yeh Jo Halka Halka Suroor Hai" (including vocals) at live concerts. Many other artists have also cited Khan as an influence, such as Grammy-nominated Pakistani-American Nadia Ali, Peter Gabriel, A. R. Rahman, Sheila Chandra, and Alim Qasimov. Author and neuroscientist Sam Harris cited Khan as one of his favorite musicians of all time. Paul Williams picked a concert performance by Khan for inclusion in his 2000 book The 20th Century's Greatest Hits: a 'top-40' list, in which he devotes a chapter each to what he considers the top 40 artistic achievements of the 20th century in any field (including art, movies, music, fiction, non-fiction, science-fiction). ^ "Nusrat Fateh Ali Khan: National Geographic World Music". Worldmusic.nationalgeographic.com. 17 October 2002. Retrieved 7 November 2012. ^ Ghulam Haider Khan (6 January 2006). "Friday Times"A Tribute By Ustad Ghulam Haider Khan, . Thefridaytimes.com. ^ "Nusrat Fateh Ali Khan". Worldmusic.nationalgeographic.com. 17 October 2002. Retrieved 16 December 2011. ^ Amit Baruah; R. Padmanabhan (6 September 1997). "The stilled voice". ^ a b c Ekbal, Nikhat. Great Muslims of Undivided India. pp. 28–29. ^ "Ustad Nusrat Fateh Ali Khan: A tribute, Hindustan Times". ^ "Nusrat Fateh Ali Khan Profile on PTV". ^ "Chapter 13". Great Muslims of Undivided India. 2009. ^ a b Manheim (2001). Michel Andre Bossy, Thomas Brothers, John C. McEnore, ed. Lives and Legacies: Artists, Writers, and Musicians. Greenwood Publishing Group. p. 105. ^ Moon, Tom (8 January 1997). "Babyface Captures 12 Grammy Nominations He Equaled A Mark Set By Michael Jackson. Awards Will Be Given Out February 26.". The Philadelphia Inquirer (Philadelphia Media Holdings). p. 8. Retrieved 4 February 2011. ^ was born"Guru"Rahman on how the music of . The Telegraph. 22 December 2006. Retrieved 18 February 2007. ^ "Previous winners of the UNESCO Music Prize". The Times (London). 18 September 2008. ^ "Artists unite to celebrate British Asian Music". Retrieved 24 August 2010. ^ "Best Singers of All Time". ugo.com. Retrieved 16 December 2011. ^ a b Michel-Andre Bossy, Thomas Brothers, John C. McEnroe (2001). Artists, Writers, and Musicians. ^ "bqpmusic.com". Brooklynqawwaliparty.com. Retrieved 16 December 2011. ^ "Nusrat Fateh Ali Khan’s 67th Birthday". http://www.google.com. 13 October 2015. ^ "Google celebrates Nusrat Fateh Ali Khan’s 67th birthday with doodle". http://www.thehindu.com. 13 October 2015. 1988: In Concert in Paris, Vol 1. Ocora. 1990: Mustt Mustt. RealWorld/CEMA. Collaboration with Michael Brook. 1991: The Day, The Night, The Dawn, The Dusk. Shanachie Records. 1992: Devotional Songs. Real World Records. 1993: Traditional Sufi Qawwalis: Live in London, Vol. 2. Navras Records. 1994: Pakistan: Vocal Art of the Sufis, Vol 2 – Qawwali. JVC. 1994: Nusrat Fateh Ali Khan & Party. Real World Records. 1994: The Last Prophet. Real World Records. 1994: Traditional Sufi Qawwalis: Live in London, Vol. 4. Navras Records. 1996: In Concert in Paris, Vol. 3–5. Ocora. 1996: Night Song. Real World Records. 1996: Intoxicated Spirit. Shanachie Records. 1996: The Prophet Speaks. M.I.L. Multimedia. 1997: Live In India. RPG. 1997: Live in New York City. M.I.L. Multimedia. 1997: Farewell Song: Alwadah. M.I.L. Multimedia. 1997: In Concert in Paris, Vol 2. Ocora. 1997: Oriente/Occidente: Gregorian Chant & Qawwali Music. Materiali Sonori. 1998: Allah & The Prophet. Ex Works. 1998: Star Rise: Remixes. EMI. 1998: Live at Royal Albert Hall. M.I.L. Multimedia. 1998: Missives from Allah. BCD. 1999: Live at Islamabad, Vol 1–2. M.I.L. Multimedia. 1999: Visions of Allah. Ex Works. 2000: Live in London, Vol 3. Navras Records. 2001: The Final Studio Recordings. Legacy/Sony. 2001: Pukaar: The Echo. Navras Records. 2001: The Final Moment. Birdman Records. 2002: Body and Soul. RealWorld/CEMA. 2002: Sufi Qawwalis. Arc Music. 2004: Aur Pyar Ho Gaya. Saregama. 2004: Ishq Da Rutba. Saregama. 2004: Main Aur Meri Awargi. Saregama. 2004: Ye Jo Halka. Saregama. 2005: Nami Danam. JVC Compact Discs. 2006: Pukaar: The Echo. Navras Records. Nusrat! Live at Meany (1998). Produced by the University of Washington. (87-minute recording of a 23 January 1993 concert at Meany Hall, University of Washington in Seattle, during Khan's residency at the ethnomusicology program there. On 13th October 2015, Google celebrated Khan's 67th birthday with a doodle on its homepage for India, Pakistan, Japan among other countries calling him the person “who opened the world’s ears to the rich, hypnotic sounds of the Sufis”. “Thanks to his legendary voice, Khan helped bring “world music” to the world,” said Google. In 2007, electronic music producer and performer Gaudi, after being granted access to back catalogue recordings from Rehmat Gramophone House (Khan's former label in Pakistan), released an album of entirely new songs composed around existing vocals. The album, 'Dub Qawwali', was released by Six Degrees Records. It received huge critical acclaim internationally, reaching no. 2 in the iTunes US Chart, no. 4 in the UK and was the no. 1 seller in Amazon.com’s Electronic Music section for a period. It also earned Gaudi a nomination for the BBC's World Music Awards 2008.